This year’s theme, The Change Imperative: Agility and Innovation in an Evolving Landscape, underscores the rapid pace of change in today’s investment advisory and wealth management arenas. None of the topics will surprise you – they are the issues that distribution and marketing executives deal with every day. So what’s different? The urgent imperative to re-engineer the client and advisor experience with advisory accounts or risk being left behind by nimbler, more forward-looking competitors. Taking an outside-in approach, our program will share expert insights, different perspectives, and new approaches and strategies. We’ll emphasize shorter, more interactive sessions and debut a series of rapid-fire sessions highlighting new technology solutions to common business challenges. The most exclusive event on MMI’s conference calendar, the Summit annually brings together the investment advisory solutions industry’s most senior sales and marketing leaders for two days of networking and closed-door sessions focused on common challenges and opportunities. Attendees are generally Heads of Distribution, National Sales Managers, Product/Platform Executives, and CMOs. To preserve the intimate feel of the Summit, each member firm is permitted to send up to three attendees this year. As a rule, attendees should be EVPs, SVPs, Managing Directors, and business unit leaders. For more information on the Summit, contact MMI at (646) 868-8500 or events@mminst.org. Craig Pfeiffer and three prominent industry executives discuss the converging forces reshaping the investment advisory and wealth management space, the future of advice delivery, and the keys to long-term sustainability. You’ll hear directly from some of the industry’s senior leaders how they are embracing change and adapting their businesses for future success. The one thing that is constant about relationships is that they are always changing. This is especially true as it relates to the relationship between broker-dealers and their partners. On the table is the need to support research, due diligence, and portfolio construction, all of which are impacted by the changing client profile and the shifting regulatory landscape. This session highlights the latest trends affecting broker-dealers and service providers, detailing how those developments are changing everything from revenue models and partnerships to service levels. We’ll hear from experts in the areas of due diligence and portfolio construction as well as distributors about the steps that can be taken to make a positive impact on clients and financial advisors. The path forward for the asset management industry is evolving rapidly, with firms facing challenges that range from fee compression and shelf space consolidation at major broker-dealers to getting the right meetings with the right advisors. As a result, asset managers are increasingly looking for ways to reinvent themselves and their approaches to distribution and digital marketing engagement. This session zeroes in on the innovative methods organizations are using to leverage data and analytics to be smarter about how they go to market, engage advisors through value-add programs and portfolio construction advice, and structure their sales forces to better align with rapidly evolving market trends. A growing body of research confirms the correlation between better-than-average corporate profits and diversity at the executive levels. While asset managers are creating ESG products that support this data, our industry as a whole – from asset managers to advisory practices – does not reflect diversity, especially in our top echelons. This panel explores: through an ESG lens, why companies with strong diversity factors tend to perform well; the implications that the changing demographics of younger generations will have on our industry and the world; and strategies for building a more diverse workplace at all levels of the organization. The incidence of reported cybersecurity breaches has grown by more than 66% in just the past three years. And, as new technologies continue to emerge, it’s become increasingly challenging to stay ahead of cyber criminals. This is especially relevant for the financial services industry as we rely on the latest digital innovations to optimize the customer experience. Chad Renfro, Head of Enterprise Cybersecurity at Fidelity Investments, offers his insight on the changing dynamics of the global cyber threat landscape and recommendations on the preventative measures you can take to keep your business, your customers, and yourselves cyber safe. Kick back with your industry colleagues in a special evening reception to cap Day One of the Summit. We’ll provide the cocktails, heavy hors d’oeuvres, and good company. Afterwards, Miami and its many fine restaurants await those who want to get out on the town and explore. In this fireside chat, Wells Fargo Advisors’ David Kowach joins Ian MacEachern for an insightful discussion about the future of brokerage. In a free-flowing Q&A format, David will share his thoughts about where a financial advisor’s real value lies, trends shaping our industry, and innovative ways to support today’s FAs as they seek to deliver high-impact advice and services to clients. Get ready for three rapid-fire technology sessions showcasing new tools to help you manage significant advisory business challenges. The investor landscape has changed, and expectations are infinitely greater. Influenced by their everyday interactions as consumers, investors and wealth professionals alike want an intuitive digital experience. Today’s advances in technology are delivering comprehensive, easy-to-use financial advice management solutions to support advisors and enhance their services and engagement with investors. Learn how adoption of enhanced wealth management technology can help advisors free up time, pivot to holistic advice, and enable a deeper understanding of clients’ lifetime goals to help guide them toward their financial aspirations. The movement towards implementing a Unified Advisory Platform is well underway. Many firms have consolidated platforms and are starting to look at simplifying their advisory program structure. What are the challenges associated with implementing a Unified Advisory Platform and what are the benefits? How does a Unified Advisory Platform impact how advisors interact with investors in structuring and tailoring advice? Learn about key decision points and the tools available to help you implement your advisory platform roadmap. Governance, Risk, and Compliance (GRC) technology continues to evolve rapidly. In the face of constrained budgets and resources, CCOs, compliance teams, and the vendors who serve them are looking for ways to increase the efficiency and productivity of compliance professionals, support firm growth, reduce exposure, and keep pace with the technology advances of the regulators. Learn about the latest trends in GRC technology offerings and the outlook for 2019 - what firms are implementing now and what they are evaluating for the future, what tools they are choosing to build in-house vs. using third-party solutions, and which technology investments are paying dividends. The traditional sales process is inefficient, analog, and not scalable. While it’s important to recognize that digital and data can’t replace the human element in sales and marketing, they can enhance it. Think how Netflix has been able to use data to inform human decisions with respect to its original programming. Advisory sales and marketing teams have the same potential to harness behavioral data to understand their clients in ways never before possible. Learn how machine learning capabilities are being deployed to improve the user experience and drive higher engagement, more customer data, and increasing ROI for clients. The past ten years have seen a steady evolution in how advisors build portfolios, but what about the next ten? New product exposures, changing packaging structures, and evolving digital delivery platforms continue to reshape the investment advisory value proposition. This segment reviews key findings from a research project conducted by Casey Quirk by Deloitte, with input from MMI member firms, to map the future of investment advice over the next decade. Among the topics to be discussed: how technology has changed the way advisors receive product and allocation services; what the balance of product exposures will be going forward; how product development will change as a result; and how strategic partnerships will evolve to better service new product demands from sponsors and advisors. Drawing on Barron's observations of key trends in the wealth advisory industry, this segment examines likely future sources of disruption and shifts in the primary value proposition of advisors. The discussion examines the ramifications of those shifts for the U.S. asset management community, how the most successful advisors are evolving their business strategy, and what their key concerns and priorities are. The presentation closes with a series of verbatim quotes from Barron's-ranked advisors on what they want from their relationships with asset managers and how managers can best add value beyond the investment product sale. As global affairs are increasingly marked by instability and disorder, military crises, diplomatic tensions, financial uncertainties, and societal upheavals, knowledge that enhances and supports global investment decisions and strategic business planning is more critical and valuable than ever before. But the daily headlines and 24/7 news coverage only scratch the surface. In this keynote presentation, John Sitilides, a geopolitical strategist and expert on global affairs and American politics, leads us on a highly visual exploration of potential sources of global disruption and geopolitical risk – both current and future. Along the way, he challenges the traditional analyst and media consensus on the world’s most powerful political leaders, offering portraits of their decision-making processes, and the long-term political and economic ambitions that ultimately shape the international security agenda. The Summit represents a unique opportunity to build brand awareness with the advisory solutions industry’s most senior sales and marketing leaders, showcase your firm's offerings, and make new connections. A limited number of high-profile sponsorship packages are available. Investments & Wealth Institute® has accepted the 2019 MMI Sales & Marketing Leadership Summit for 7.0 hours of CE credit towards the CIMA®, CPWA®, CIMC®, and RMA® certifications. Kick off the Summit early and enjoy a round of golf with your industry colleagues. All levels of golfers are welcome for this charitable outing to benefit Gateway to Leadership. WHAT: Gateway to Leadership, a 501c3 organization administered by MMI, supports a variety of programs to foster career awareness and workforce readiness for students of color from historically underrepresented communities, particularly African Americans and Hispanics, seeking internships and entry-level employment opportunities in the financial services industry. WHERE: Crandon Golf at Key Biscayne is located about 15 miles from Miami International Airport and about 7 miles from the Mandarin Oriental. Crandon, a championship 18-hole course and former site of the Senior PGA Tour, is considered one of the most beautiful and difficult par-72 courses in the state of Florida. WHEN: Tee time is 12:15pm. For members of the MMI Board of Governors and Leadership Pathway program, we will have you back to the hotel in time for your joint function. The Mandarin Oriental, Miami is a 5-star hotel on Brickell Key, a prime waterfront location with stunning views of Biscayne Bay and the Miami skyline. The hotel is 25-30 minutes from Miami International Airport, 40-45 minutes from Fort Lauderdale-Hollywood International Airport, and 5 minutes from the Port of Miami. 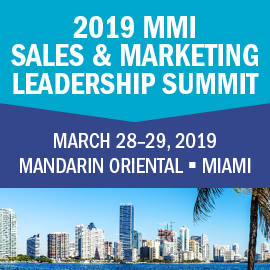 Important Update (March 12, 2019): The MMI room blocks at the Mandarin Oriental and the two overflow hotels (Hyatt Centric Brickell Miami and Conrad Miami) are now fully booked. Rooms are currently available at these nearby hotels on a space and rate available basis. Online: Follow this link to reserve rooms online. A $100 discount is available for additional participants from the same firm once two participants have enrolled at the full conference rate (i.e., participants who used other discount codes do not count toward eligibility). This discount may not be combined with other discounts or other reduced fees. Please contact MMI at (646) 868-8500 for the discount code. All cancellations and transfers are subject to a $50 cancellation/transfer fee. Full refunds minus the $50 cancellation/transfer fee will be granted for cancellation requests received prior to 5:00 PM ET on Friday, March 8, 2019. After that time, no refunds or credits will be granted, however your registration can still be transferred to another individual at your firm. To cancel or transfer your registration, please notify MMI at (646) 868-8500.